Is it true, as Lord Acton wrote in 1887, that "Power tends to corrupt, and absolute power corrupts absolutely"? If so, the many forces entering battle in Colonial America must have hosted a lot of corruption -- because each of them struggled wildly to seize power in the New World. The French, the British, the newly developed Colonists ... But what about the Native Americans? In author Eliot Pattison's hands, the tribal forces of 1760 may demand an exception to the rule. Knowledgeable about their land and its seasons and weather, wise in the movements of animals and growth of plants around them, and carefully balanced against each other's tribes -- or clans, as Scottish exile Duncan McCallum sees them -- the tribes of the Iroquois federation want power over themselves. But not over the Europeans. Without that hunger for absolute power, they'll avoid the depths of corruption already sweeping through the military forces around them. At least, it seems that way to Duncan, traveling north toward a village by Lake Champlain with his aging but gentle and wise friend Conawago, who may be the last of the Nipmucs. That's how others know this sage. Yet Duncan knows the contents of the letter Conawago has, the one that's pulling him north. It says there are two other Nipmucs alive, in a settlement of Christian Indians. Heartbreak! The pair of travelers arrive to find a murdered settlement -- including Conawago's nephew -- and increasing evidence that robbery and more murder have spread among the Scottish forces working for the British. Duncan even discovers a roped and drowned clansman under the lake's waters: "Duncan could not bring himself to touch the body, but he gripped the wheel to study it wuth the more deliberate gaze of the doctor he had trained to be. ... The death had a slow, organized aspect to it." This is the frame Pattison has used in Bone Rattler and Eye of the Raven to turn Duncan McCallum into a forensic expert and investigator. Skilled in "hearing the voices of the dead," McCallum's observations and experience add up to a hyper-awareness of the evil that people can do. Wouldn't it be nice to blame it all on the British, or at least on the French, reaching down with other Native allies -- especially the Huron -- to challenge the ownership of the rich lands of New England? Pattison, who also writes a series that involves Tibetan Buddhist lamas in Chinese-occupied terrain, crafts a many-layered plot that hinges on evil being possible for anyone, no matter what their origin or "clan." Soon McCallum and Conawago find themselves chasing a tribal leader named The Revelator. And the Iroquois council puts an added burden on them, one that McCallum discovered and would have embraced anyway. They are to rescue a group of kidnapped children. Turning the tables on classic "Indian Wars" tales of white settler children being kidnapped, Pattison instead reveals a daring plot that involves holding the young children of tribal leaders, for ultimate leverage. Then he winds McCallum in accusations from so many directions that it seems everyone is willing either to kill him or capture him (or both). As evidence of criminal activity gradually adds up so do the deaths of McCallum's friends and allies. Battle is about to begin, and it's unlikely that rescue of the children can take place in the midst of such death and destruction: that absolute form of corruption of life, after all. Parallel to his Inspector Shan/Tibet series, Pattison's Bone Rattler books dare to compare forms of spiritual wisdom and pathways, looking not just at evil (crime fiction, after all!) but at the nature of good. This third Bone Rattler "mystery of Colonial America" raises intriguing questions and insight into the clash of cultures in the New World -- even as it sets up McCallum and Conawago to risk everything for the chance to keep the Native tribal cultures viable for a generation longer. A good read -- and one that's left me thoughtful and ready for a long, long walk in the forest. MEET ELIOT PATTISON at Kingdom Books on Sunday July 28 at 7 pm; or if you can't be here, reserve a book or two, signed, and we'll ship them to you the next day. Also featured in this event is Pattison's newest book in his Inspector Shan series (see yesterday's review). 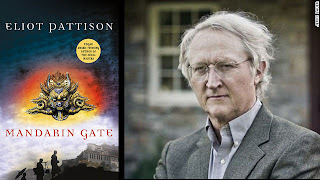 We'll have copies of both of his newest books -- Mandarin Gate and Original Death -- but in limited numbers, so please contact us (802-751-8374 and KingdomBks at gmail.com) if you'd like to reserve copies of these or other Pattison mysteries for signature and purchase. "The end of time was starting in Tibet." That's what the Buddhist monks, the old lamas, around Shan asserted, as Chinese occupation of their "autonomous territory" continued to bring political oppression -- and punishment and death to the believers. For Shan, the Chinese bureaucrat turned prisoner and then uneasily paroled in Tibet, what the lamas said might be true. But did that mean he should let the occupiers harrass and kill his friends? In the titles before this one -- the Edgar Award-winning Skull Mantra, then Bone Mountain, Beautiful Ghosts, Water Touching Stone, Prayer of the Dragon, and The Lord of Death -- Shan's determination to protect his friends has meant repeated capture and torture for him. The meditation and other routes to inner equanimity, even laughter, that he learned from the lamas helped him to sustain his loyalty and the physical pain he's endured. Then again, there's the peril his grown son remains in, such that any independent action by Shan can mean the death of his imprisoned son. We readers have seen Shan's determination and integrity tested repeatedly in this situation. But now -- is the world ending? The shocking death of one of the monks as the book opens might be evidence toward "Yes." Shan's uneasy position as one who can read the evidence of death, but also grasp the ways in which the worst of the Chinese are spiritually dead, pulls him into investigating a vanished monastery, hidden monks and nuns, and corruption among the Chinese army officials. A killing of three people, including a Tibetan nun, turns out to relate to a government plan that's as brutal as it is powerful, and Shan must stop it, as well as protecting an American woman who's witnessed some of the underlying puzzle. Time and again, he needs to act on the potent scrap of wisdom he has shared with his son, Ko: Push down your fear. It is the greatest power a prisoner can have. MANDARIN GATE paints the grimmest portrait that author Eliot Pattison has ever offered of what takes place in Tibet today. At the same time, ironically, it also engages with spiritual strengths and teachings more fully than any of the earlier novels. As Shan races from one imperiled friend to the next, he rarely doubts what he must do. And the tension of the book steadily increases, as more risks must be taken. In his Author's Note at the end of the book, Pattison writes, "Tales of those who have been thus abandoned by history are so plentiful at the roof of the world that they almost seem ingrained in the landscape. While there is much ugliness to be found in the behavior of the government in today's Tibet, the power of that rugged landscape sometimes seems to eclipse it -- and certainly the stark beauty of their land is only enhanced by the enduring strength of the Tibetan people. MEET ELIOT PATTISON at Kingdom Books on Sunday July 28 at 7 pm; or if you can't be here, reserve a book or two, signed, and we'll ship them to you the next day. Also featured in this event is Pattison's newest book in his Bone Rattler series (see review tomorrow). Eliot Pattison must have an amazing work ethic: He writes three mystery series, while also maintaining his career as an international attorney. How does he do it? What's next for this much-acclaimed but private author? Find out in a rare conversation with Pattison, here at Kingdom Books, on Sunday July 28 at 7 pm. We'll have copies of both of his newest books -- Mandarin Gate (an Inspector Shan mystery, set in Chinese-occupied Tibet) and Original Death (third in the Bone Rattler series, set in Colonial America with both Scottish and Native American components) -- but in limited numbers, so please contact Dave (802-751-8374 and dknel at charter.net) if you'd like to reserve copies. We also have many of Pattison's earlier books; click here to see the list. 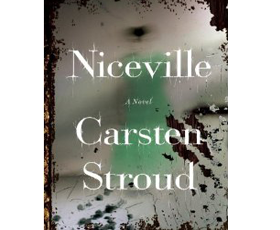 One of the epigraphs to Carsten Stroud's crime horror novel Niceville is from "Tartuffe": "Malicious men may die, but malice ... never." After that moment of high culture, the book sweeps into nonstop small-town action and suspense, told from multiple viewpoints -- most of them, through the eyes of clever and emotionally frozen criminals who seize opportunities and don't care who gets hurt along the way. Some of these sociopaths are trim and elegant, like Coker, the police sniper, a "Clint Eastwood" figure with silvery hair and compelling gaze; others, like Byron Deitz, look nearly as ugly and creepy on the outside as on the inside. And then there are Nick Kavanaugh and his wife Kate Walker, a family-practice attorney. Maybe their exteriors aren't as clearly painted. But they are the smart, kind people here -- along with Native American (Maiami tribe) Lemon Featherlight, whom all the women warm up to. Of course, Nick has a crimp in his military past that's preventing him from going back to active duty, and Lemon has a rap sheet that's turned him into being a CI, a confidential informant. And Kate? You could say she gives her love and loyalty so passionately that she complicates life. Or, like Nick, you could admit she's simply standing for honor, something he holds just as dear as she does. So, where does that leave Rainey Teague, whose probably distant relatives keep turning up in the threatening situations that surround Kate and her allies -- but who is (at least on paper) just a half-grown kid fresh from a year of a coma, welcomed by Kate into her home and heart -- what side is Rainey on, anyway? Kate's? Or, umm, the dark shadowy threat that keeps interfering in his life but seems to be attached to him? This week is the release of book II in the Niceville trilogy: THE HOMECOMING. Reading it was the bravest thing I've done this year. It's so darned good ... the action is so swift, the twists so unexpected yet fitting, and the determination that Kate and Nick show is so irresistible. But -- and this is a big but -- I knew as I devoured it (407 pages!) that nothing big would resolve or clarify by the end, because (groan) there's still another 400+ pages to go, in 2014, in The Reckoning. OMG!!!! Maybe you've already had the good fortune of staggering through Tanya French's or Stuart Neville's Irish crime fiction, where the weight of a violent past -- of a person, a family, a country -- cripples and haunts the living women and men who grapple with crime (on both sides). 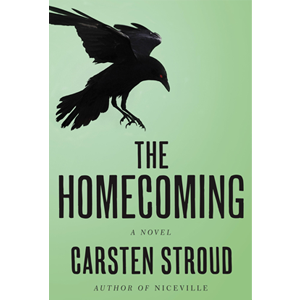 Stroud crafts the U.S. version, and evil's presence in THE HOMECOMING is vicious, hungry, and dark. A Florida resident, he's set the scene in a Southern town called Niceville, which dates from 1764 but takes its undercurrents from events during the Civil War (a.k.a. the War of Northern Aggression) and the decades afterward, including World War I. Something about the interactions of Niceville's four founding families is so saturated with shame and rage that there's a dark force stalking the town's prominent citizens even now. Stroud's writing is rich and colorful, and took me instantly to the Deep South (Niceville is within a night's driving distance of Metairie, Louisiana). That restless growth and fertility, the bitter enduring heritage of slavery's brutality, abuses of power by class, gender, and race -- they all surround Kate and Nick. Even with the tribal knowledge that Lemon Featherlight adds to their grasp of the forces around them, chances look pretty slim that they'll escape unharmed. Each one even wonders whether their marriage will hold up as they struggle with Rainey Teague's terrible heritage. So here's the deal: You can pick up a copy of Niceville (the first book) in hardcover now, or wait until mid August when it comes out in softcover. But I suggest getting THE HOMECOMING right away. Stroud is a deft and powerful writer -- he gives enough detail in this second book to cover for the first one, without spoiling anything major in it, so it will work fine (in this rare case) to read the books in reverse order if that's how you access them. And then you can join me in the agonizing wait for June 2014 and the third book in the Niceville series. (Here is Stroud's website to reassure you.) Misery loves company, they say. I wonder whether malice would say the same? Shiver. I'm shaken by Stroud's very personal version of evil and malice. But I trust Kate and Nick, and most of all, Lemon. I want to read the third book. If only I were enough of a Stroudian sociopath to go steal the manuscript from whatever publishing safe it's waiting in. Oh wait -- is the dark presence in Niceville affecting me now? PS -- I see I've left out the details of how amazingly funny the situations can be that Stroud's villains create around themselves. I only want to add, though, that the black humor never spoils the tension. Not even when the Chinese get involved. The Chinese in the American South? Think fancy Lear jet. Really. We're honored that ABE Books selected Kingdom Books for its new program in allowing some small (boutique!) booksellers to offer a discount through its online listings of our books. 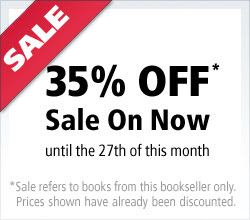 From now through July 27, 2013, all our yummy mysteries, poetry (yes, we re-listed hundreds of poetry books, many signed, because we knew this was coming), and quirky eccentric delights that we couldn't resist -- they are ALL 35% off. I've saved up boxes for shipping, and Dave is ready to answer any questions about condition, authors, and more. Reviews coming ASAP—on Carsten Stroud's amazing new thriller; plus a book in the new genre of "Thuglit"; and more.